New Year's Eve had been different, and so was New Year's Day. Since the lack of daytime TV prevents the usual ritual of watching parades and bowl football games for hours on end in Saudi Arabia, it was necessary to find alternate entertainment. So we selected one of our favorite and most available pastimes – a sand dune picnic. The weather was perfectly beautiful in the 80's, with no wind blowing. So we gathered a few friends and drove to our favorite dune on the road to Qurayyah Beach. We slowly hiked up the windward side to the peak, then slid down the inside steep slope on large, flat sheets of plastic. It was fun, as usual, but after all the parties that weekend, all we could manage were a couple of go-rounds. Then we built a fire out of fried camel bushes, cooked our wieners and beans and relaxed on the blankets we had spread on the flat sand base. It wasn't the usual black-eyed peas and ham we had on New Year’s Day but was a darn good substitute. It was finally back to work for both of us the next day, January 2nd, 1978, and getting settled back down into the normal routine. I still didn't have a desk but was just being utilized wherever needed. For some reason, there was just one maintenance manual for the new air conditioning units being installed in the new houses, so I spent hours xeroxing the pages of that manual and putting together a copy for each maintenance man who would be servicing them. 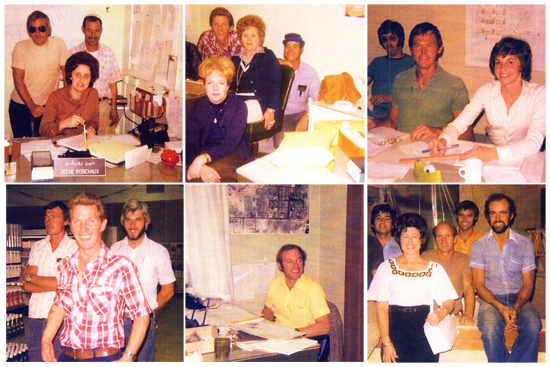 At other times I helped xerox necessary papers to be sent with contracts to Dhahran for approval or helped out with work orders for the 6 and 3 crew and at the "call desk". Community Maintenance coworkers and offices. There was always something different and unusual to do. Other women who worked over there used to tell me they did nothing but read books and write letters at work, but I certainly hadn't found that to be the case. It was still fun and interesting though and continued to have its rewards. Our friend Jack Hayes stopped by to say "hello" when he was in camp, and George Stein and others who worked at ACC with Kathi and Ruth stopped to chat when they were in our building on business. Oran and I had planned to go to Al-Khobar shopping that first weekend, but he had developed a cold so he wasn't feeling too perky. Instead, we just got some much-needed rest after the holidays. I did go to the open house the company had for some new houses completed on Country Club Road. That was aptly named, as it was located right in the middle of the golf course, north of Ain Nakhl Golf Clubhouse surrounded by holes #1, #2, and #9. There were 4 different styles of either free-standing houses or duplexes. What a difference. Ain Nakhl Golf Clubhouse; Gold Course first tee-off mound. 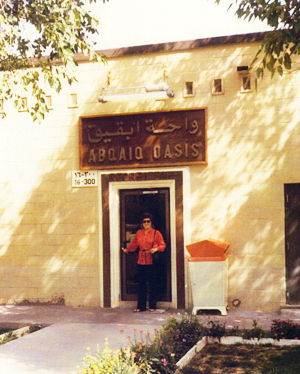 By January 11th, 1978, Abqaiq's new "in camp" gas station was open, much to the relief of all, especially the women. It was located on 9th Street between the AAA Garage and the Holiday Inn. Of course, we didn't have a personal automobile at that time, but I had occasion to accompany Sheila and some of the other women who took advantage of it from time to time. That same day we received our first letter from Vicky after the "first ever" Christmas we had been apart, and it was most unusual. It was rolled up in a small tube about 6 inches long and contained a pine needle sprig from her real, live pine Christmas tree. If the Arab sensors looked inside, they probably thought we were really crazy Americans, but we thought it was really neat. Since she had opted to stay in Utah instead of going to be with Keith in Richardson, we were glad to hear she had spent a very nice Christmas with one of her friend's families there. Her New Years Day had been unusual as well when she and some friends had gone skiing at the Sundance Ski Resort near Provo Canyon. She had the honor of falling right in front of Robert Redford as she got off the ski lift, and saw him again later with his family when they ate in the Tree Room Restaurant there. To top off her day, she watched the Cowboys beat Minnesota on TV. Oran and I both sure wished we could have been with her that day. Since Kathi and I both worked now, it was hard to find time to get together for just a good old-fashioned gabfest, but she came by after work on Wednesday, January 18th, 1978. While she was there, Labib Tannir, a Lebanese man in my bowling league, came over with a large crate of the most beautiful vegetables we had ever seen while living in Saudi Arabia. 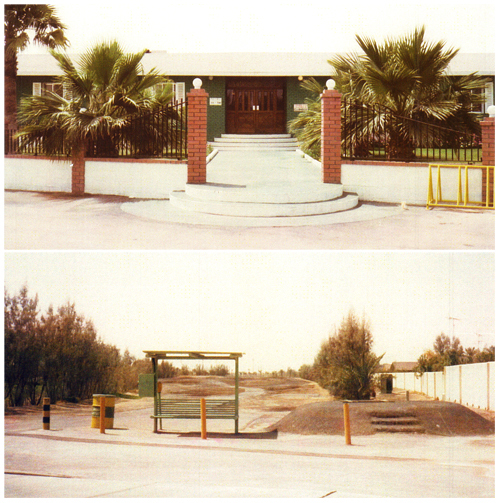 Labib worked for Aramco as well and was manager of one of the experimental farms in the Al Hasa Oasis near Hofuf. 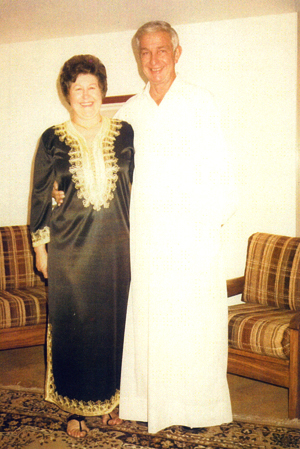 Colleen and Oran in Arabian robes. He had been telling me about his work and had promised to bring me some fresh vegetables, but I was very surprised, though of course thrilled when he did. Kathi and I were like kids in a candy store, checking all the contents of the crate – big, fresh-looking, heads of lettuce, perfect tomatoes, squash, cucumbers, and carrots. I shared the contents with her, naturally, and insisted Labib stay for a drink with us and Oran, who had gotten home by that time. Our New Year’s Day sand dune picnic had been so much fun we decided to do it again the next day, Thursday, January 19th. Sheila and Keith Kaul (and Sammy, their dog), Kathi and Roy Steindorf, Johanna and Janus Verhoven, and Inga and Gary Deese went with us. After sliding down the dunes for a while, we decided to explore the area further, so we walked up over a couple of sand dunes further away from the road, and followed a moist looking "wadi" for a ways. (A wadi is the dry area of land at the base of the sand dunes where the water flows when it rains.) There didn't seem to be much difference and we were afraid to get too far from the road, as it’s so easy to get lost and disoriented in the desert, so we went back to our favorite area. There we built our fire, cooked our hot dogs and beans, and, as an added touch, heated coffee in a brass Arab coffee pot on the open flames. It had been an even more fun and interesting day. The Verhovens had us over for drinks the next Wednesday, January 25th, before we went to an Al-Mojil dance at the Abqaiq Construction Camp. We were about ready for a dance and outing after the holidays. In fact, we had been invited to a party at Bob Howie's, my Scottish bowling partner of last year, so we stopped by there afterward. The next night the Qurrayah Yacht and Beach Club had their first of the year "Commodore's Ball" at the Ain Nakhl Golf Club. The popular Al-Mojil Band played for that, as well. On Saturday all members of the Abqaiq community were invited to an open house of the newly renovated "Walnut Room", the special upstairs, "weekend only" dining and private meeting facility in the recreation building. I had already had the pleasure of seeing it, as our 6 and 3 Community Maintenance work crew had done the work, and I must say, it was lovely. Things seemed to be going along quite well, but the thing that I had been dreading most happened. We had already planned our vacation to the States for May, and Oran said that he was definitely going to resign, so we wouldn't return to Saudi Arabia after that. In fact, a couple of our friends had talked about resigning too or transferring back with their parent companies, namely Roy Steindorf and Jack Adams. In a way, I could understand why. The company was really changing. The camp had practically doubled in size since we came, as so many new employees had arrived for the 2nd phase of Saudi Arabia's expansion plan. The small town atmosphere of our camp was disappearing. Also, the original foremen had completed their jobs of starting up the Water Injection Project in the Southern area Ghawar Field, as they had been brought over to do. And Udhailiyah was a thriving family community now with others to take on that work. I had a feeling Oran was really serious about leaving this time too, which made me sad. I would hate to have to give up living in the country of Saudi Arabia, which I loved, with it's beautiful, warm weather, and the lifestyle I found so satisfying, but I would have to adjust. I would just try to enjoy the rest of the time I had left there and do as many things as possible.